Cummins has presented its coveted Six Sigma award to Concentric Inc. a division of the international Concentric group, the world leader in pumps for medium/heavy diesel engines. 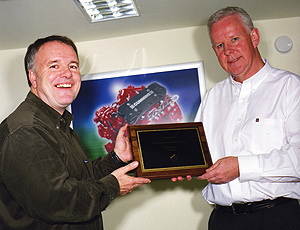 The award was one of six given to Cummins suppliers and, in the words of the citation, is in recognition of "outstanding Six Sigma performance" during 2005-2006. The Six Sigma programme at Concentric Inc. was inaugurated in 2005 and there is now one full-time Black Belt and eight trained Green Belts. The company has already completed six projects and all employees are trained to Yellow Belt standard, in order to give them a good awareness of the Six Sigma initiatives. Concentric uses the DMAIC process - Define, Measure, Analyze, Improve, and Control. Projects are selected primarily on the basis of high-profile customer satisfaction issues such as quality, and delivery. Each project is documented with a summarized storyboard that is posted on a notice board, where all can see it, and project leaders report progress at a weekly 'Cost of Quality' meeting that includes the company President, as well as key managers from the production and quality areas. Deployment Champion Pete Moran commented: "After year one we found the best strategy for our company is to run narrowly focussed projects that generate rapid results in the shortest amount of time. This ensures that the project does not get lost in time and tends to hold the attention of the team members due to the fast-track pace." "Past projects range from a revised customer returns process to increasing capacity in manufacturing cells, from solving several internal quality issues to simplifying 'unknown cause detection' of work order variance for our cost accountant. The goal has been to embed the DMAIC methodology into everyone's daily routine as the standard problem solving method used at Concentric Inc. I am confident that this has given us the toolbox to solve any problems that may surface from time to time." Concentric is a long-established supplier to Cummins, a typical example being the suite of oil, water and fuel charge pumps for the ISL engine with its innovative CAPS II fuel system. With its headquarters and technical center in Birmingham, UK, Concentric PLC is a major supplier to the world's truck, agricultural and construction equipment industries. The company has four plants around the world, manufacturing oil; water and fuel transfer pumps, as well as integrated front cover assemblies for diesel engines. In addition, it also supplies lubrication pumps for transmissions and reciprocating compressors.